This is the master of all microbrew beer gifts because it delivers a variety of flavors from some of the best breweries. Your lucky gift recipient may find flavors that they love alongside flavors that they've never experienced before, and they'll enjoy looking at the colorful labels and determining where each microbrew was produced. 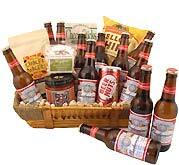 If you have a beer connoisseur in your life, this is the master beer basket that they'll appreciate. It's also perfect for the beginning drinker or someone interested in giving their taste buds an unexpected buzz. 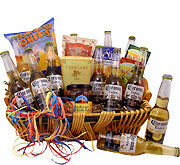 This is our second corporate order - clients love the basket, you make us look good!!! thank you for such reliable customer service and prompt shipping. 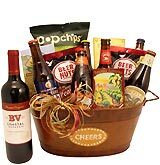 I sent this gift basket to my nephew for his birthday and he absolutely LOVED it. He is a beer lover and loves to try all kinds of beer. He was so excited and happy when he received it. This is the second time I sent him a basket from you. This time I sent him your BIG basket. Thank you for making his birthday so special. Ordered 1 week before Christmas and it arrived 3 days later! It shipped 3 hours after I ordered it, I was blown away! No extra shipping charges either( like other websites charging $35 to get by Christmas) My brother loved his basket and I will definitely order again! Thanks!! I sent this basket as a gift for my brother's 60th Birthday. He is very difficult to shop for but he does like special beers so this was a great gift. He claims it was the best gift I have ever sent and of course it FITS. Outstanding gift. Bought for a birthday gift, well packaged and great value. Shipped on time and tastefully done. I would highly recommend their use for future purchases. Great product. person loved it. Would be nice to have a few more choices in the $95-$125 range with more beers even if that meant fewer snacks. Love the craft beers. I sent this as a gift to my brother and his wife. They really enjoyed both the beer and the snacks that come in this basket. Told me it was a great gift! What can I say my dad likes beer. So naturally this was the right gift for his 80th birthday. Nice gift, good value! Beer Gifts I will be back for more. I sent this to my son for his Birthday. He loved it. He thought it a was such a unique gift. I will be sending more baskets for the holidays. This gift was purchased for my son, who enjoys sampling beers from all around the world. He was very pleased with this gift of 12 microbrews. Never knew what to get my son who has everything. The craft beers are perfect. He really enjoys the whole basket of gifts. Was a gift for my friend. Purchase and delivery, and also reply to inquiry, was quick and easy. Happy with their service. what a great birthday gift for my son, 43. he loved it. also for people who are hard to buy for. My beer lover really enjoyed the basket. It was shipped on time and represented a good value. Though it was busy season, they kindly notified that my gift would make it ontime for my bud. 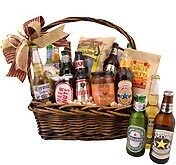 Gave 12 pack basket as business gift and reception was very positive. Clever presentation. I sent this as a gift to friends. They liked it very much. Great gift for the beer lover. Good value and delivered as promised.